You’ve heard the news by now that Yahoo’s new CEO, Marissa Mayer, declared the end to working from home for Yahoo employees. They have been given three months to get their homes in order and get back to the office. Yahoo says the return to work is to build collaboration and form a unified Yahoo. Is Mayer risking too much with this change or is the change a slick move? Keep in mind that Mayer was hired to “right the ship”. Yahoo has been going downhill fast (one recent CEO there was fired for lying on his resume and others failed), and she’s there to turn it around. Clearly, what they are doing now is not working, so changes are necessary. Wouldn’t it be silly to keep doing what they’ve been doing when what they’ve been doing is not working? Wouldn’t it be silly to retain the flexible work location just because Google and Facebook offer it to their people? Yahoo is not their peer and its people are not holding up their end of the bargain by actually working while at home. I’d bet Mayer didn’t issue the change without identifying the most important contributors and how they work. Unfortunately, she found out that most of the people working from home were complacent. Complacency ruins companies. She’s not going to let Yahoo go down without a fight. On the other hand, research shows that flexibility is important to workers today. Companies that offer flexibility enjoy lower turnover, higher employee satisfaction and engagement. Mayer might be jeopardizing the highly productive, engaged, and motivated employees in an attempt to boost collaboration or rid the company of underperformers. Some people have noted that top talent won’t join Yahoo now because they will not have the flexibility to work from home. That’s a risk Mayer is willing to take. Frankly, I doubt top talent would be focused only on this one issue. They will come for other perks, if the company turns itself around. · The change is not odd. It makes sense that an industry that relies on innovation, which is built on collaboration, would want people to be together. · It sends the positive message that people are so valuable, they need to collaborate more. If you don’t want to, feel free to exit may be the underlying message, but the outward message is positive. · It’s a great way to get rid of the complacent people taking advantage of the flexible option without having the cost of layoffs. 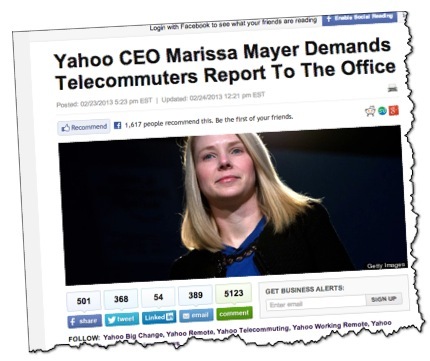 · It shows analysts and customers that Yahoo is not afraid to make bold moves. · The change is temporary. They’ve said it is necessary “right now”, which leaves it open to change in the future or on an as-needed basis. This might be the tipping point for coddling. In some places, employee engagement has run amok and people have taken advantage. Companies are waking up to the fact that they pay good money and it is reasonable to expect something in return. When people don’t hold up their end of the bargain, companies are going to coddle less and open the exit doors more. As companies wake up to their power, complacent employees will be the most vocal protesters. Mark my words: the coddling days are coming to an end. The days of genuine caring will continue, just the coddling will stop.